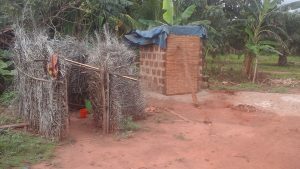 We’re currently building latrines in two villages, Afromano and Bobin. Now that the rains are with us, work in Aframano has come to a halt. The roads are very bad, sometimes impassable, and it’s terribly difficult to work in these conditions. On top of that, Aframano is a long way from town and people have picked up very limited building skills, for example, they have to be taught to make mud bricks. By contrast, in Bobin, all the mud bricks were made sometime ago and when the rains are light construction can continue. 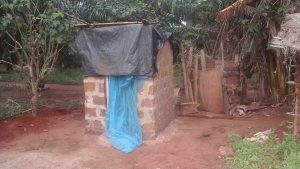 Bobin people are really keen to get latrines, as they’ve heard over and over from other villages that latrines and hygiene training mean that diarrhoea will disappear. So they’re determined to continue work whenever it’s humanly possible. 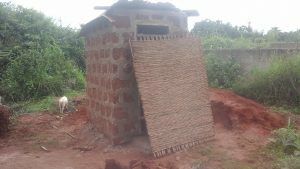 Here are a few pictures of how they shelter their half-finished latrines from the weather.